In stock -This product will ship today if ordered within the next 2 hours and 34 minutes. All Lumie products are supplied with a UK plug only. 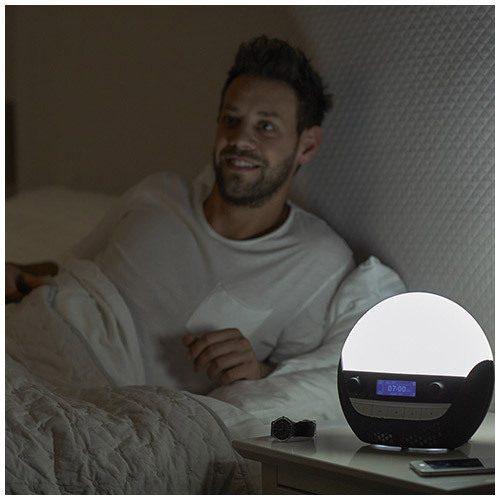 Bodyclock Luxe is an alarm clock that mimics the light of a real sunrise, so that when you open your eyes, you feel properly awake and refreshed. Waking like this helps to keep your sleep cycle on track and has been shown to boost mood and energy levels. The most advanced in the Bodyclock range, the Luxe 700 has high-quality speakers for streaming your own music or for radio via Bluetooth, as well as a USB port for more audio files or for charging your phone. It also comes with over 20 wake-up and sleep sounds, from classic birdsong and waterfall recordings to background café chat and fading thunder. At night, the Bodyclock Luxe has a fading sunset to help you relax and a new low-blue light feature especially for bedtime lighting. By keeping blue light to a minimum, you’re ready for sleep and can drift off easily. 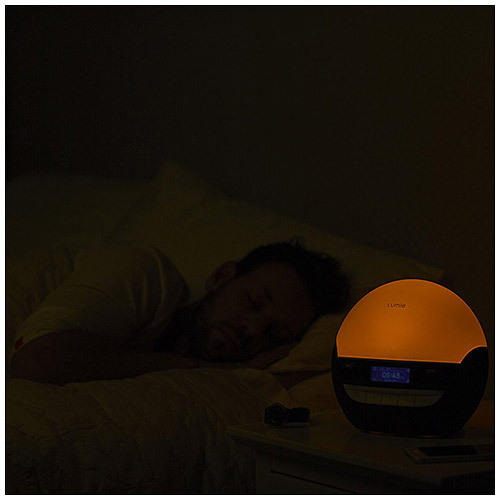 Other features include a nightlight setting, 7-day alarm and dimmable bedside lighting. 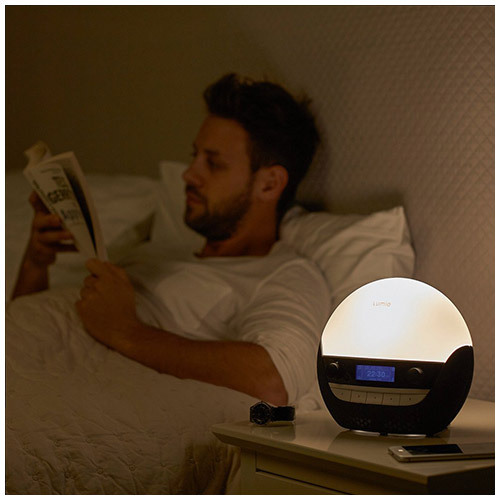 A wake-up light like the Bodyclock Luxe is not just a much nicer way to start the day. It can help beat the winter blues and is a useful complement to a lightbox in treating SAD (Seasonal Affective Disorder). Please Note: These clocks are UK models only and not for use in the USA. 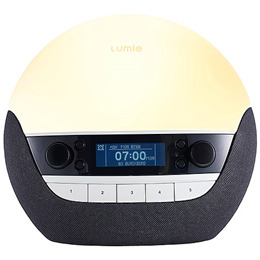 Take a look at our Lumie Arabica SAD Light Box and Lumie Luxe 750D Sunrise Alarm Clock to find out more about the benefits Lumie products have to offer. They help to alleviate SAD (Seasonal Affective Disorder) and the Winter Blues. Bodyclock`s use your body`s natural response to sunrise and sunset to help synchronise your circadian rhythm (sleep/wake pattern). Using the Bodyclock will help regulate your melatonin cycle to keep levels high at night (making you sleepy) and low in the day (keeping you alert). So you sleep better at night and feel more energetic during the day. One of the major causes of SAD is a circadian rhythm that`s out of sync, which happens especially in the winter in northern countries. The Bodyclock helps to get your sleep/wake pattern back in sync. Clinical studies have shown dawn simulation to have a dramatic effect in relieving the symptoms of SAD as well as improving mood, energy, productivity and ease of awakening. 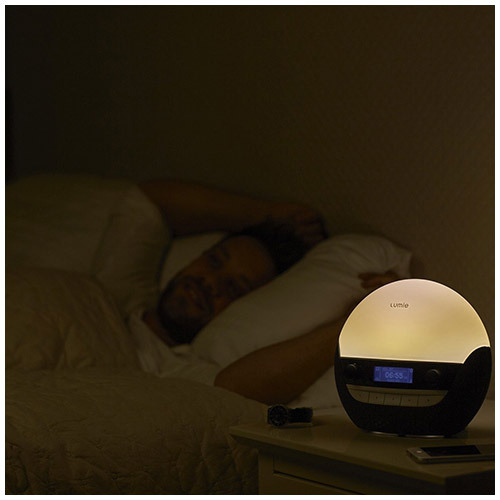 Below are reviews of Lumie Bodyclock Luxe 700 - Sunrise Alarm Clock by bodykind customers. If you have tried this product we'd love to hear what you think so please leave a review. Excellent bodyclock lamp. Works brilliantly, very flexible alarms can be different every day. Just what I needed. I phoned Bodykind as I had a question about the Lumie clock and the person that answered was extremely helpful and answered my question. This in turn led to me purchasing the clock for my husband who gets a bit miserable in the mornings when the light is a bit low. He has said that it's easy to operate and has found the light to be good for his mood, he especially likes the fact that the light comes on slowly. Very happy with the purchase.